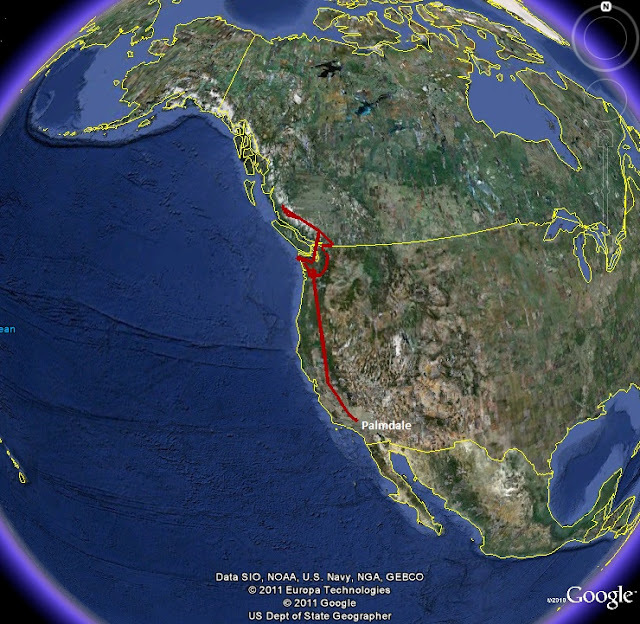 NASA DC-8flight track (in red). 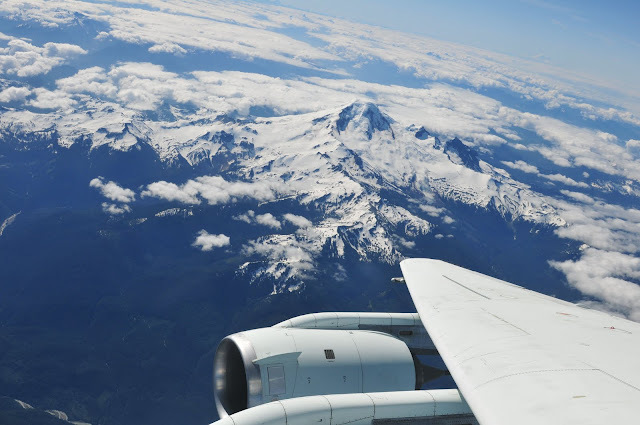 The DC-8took off from the NASA Dryden Aircraft Operations Facility in Palmdale, Calif.,flew north through the Cascade Mountains and into southern British Columbia, Canadaduring an eight-hour flight on Sunday August 7, 2011. 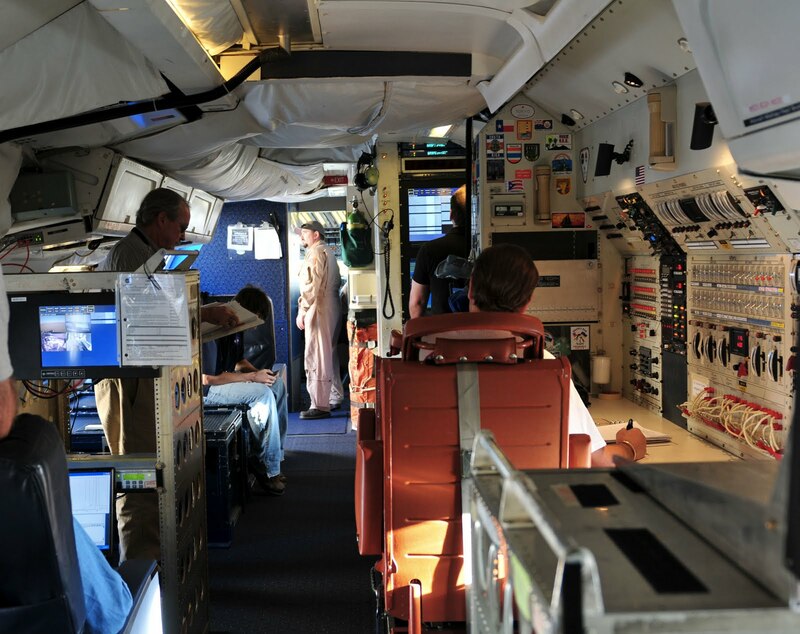 The pilots, crew, and scientists met at 6:30AM inside the hangar at the NASA Dryden Aircraft Operations Facility. After the flight briefing, we boarded the DC-8 and took off at 8AM, heading north from Palmdale. 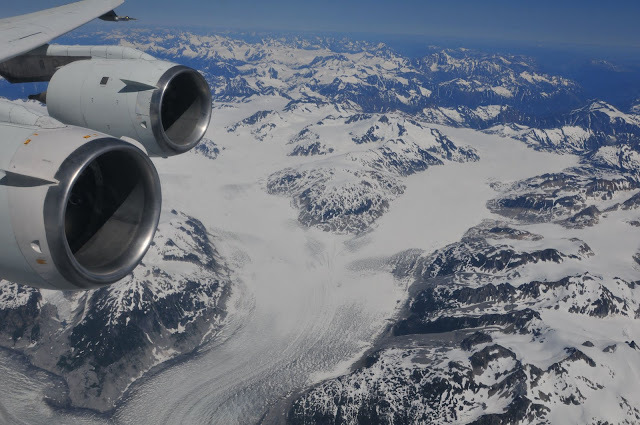 One of the goals of this flight was to test the performance of the instruments over a wide variety of terrains, including vegetated surfaces and surfaces covered with snow and ice. In order to find snow in August, we flew to the northern Cascade Mountains in Washington State and British Columbia, Canada. After takeoff, we traversed the California Central Valley to test the performance of the instruments over vegetated terrain. We continued north through California over the Cascade Mountain Range, flying through Oregon, Washington, and Southern British Columbia, Canada. Along the way, we saw many famous peaks of North America including Mt. Shasta, Mt. St. Helens, Mt. Rainier, and Mt. Baker. We then crossed into Canadian airspace and continued northwest, flying over numerous glaciers and snowfields. All of the instruments were performing well, which afforded many of the scientists and crew the opportunity to step away from their computers and consoles and look out the windows at the beautiful scenery passing by below us. Another goal of the mission was to directly sample carbon dioxide in the atmosphere to compare with the remote carbon dioxide values measured by the laser systems. We flew in slow ascending and descending spiral patterns while directly measuring carbon dioxide as we increased or decreased in altitude. 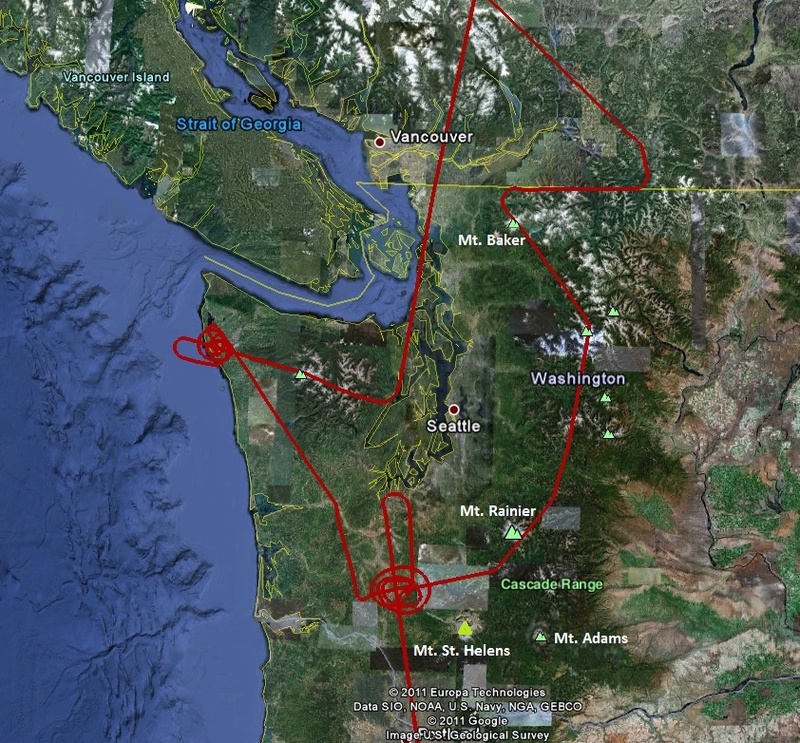 Once we re-entered Washington State after flying over the Canadian glaciers, mountains, and snowfields, we flew in a descending spiral pattern, decreasing in altitude from ~20,000 ft down to ~2000 feet. 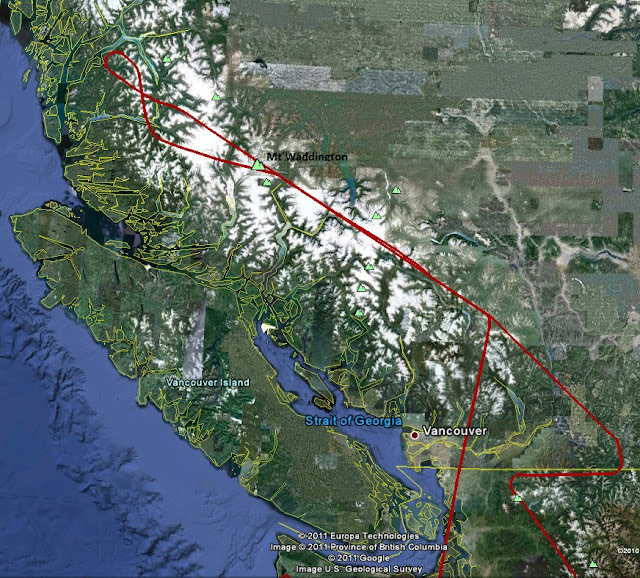 We then flew a planned missed-approach over a small airport near Forks, Washington (Quillayute Airport). After the missed-approach, we climbed back up to 12,000 ft, flew to another small airport near Toldeo, Washington (Ed Carlson Memorial Field), and flew another missed-approach. Following the second missed-approach, we flew another spiral pattern, this time steadily increasing in altitude until we reached 31,000 ft. This last spiral pattern allowed everyone onboard to see Mt. Rainier, Mt. Adams, and Mt. 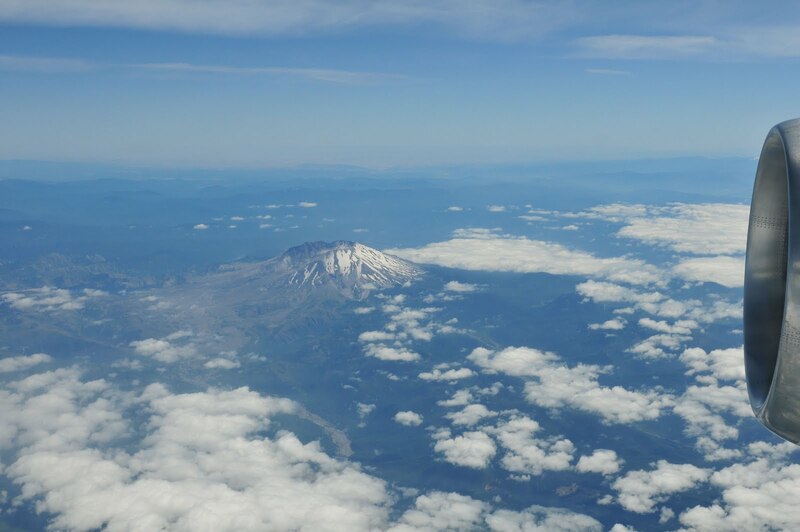 St. Helens multiple times. Though a bit tired from the 8-hour flight, all onboard were very excited with the quality and abundance of data that was collected.